Packing and moving is enough to fill the most easy going of minds with dread, but fear not as a big move doesn’t have to spell disaster. A good packing routine and technique can really help things along to a smooth and stress free home removal making your relocation as stress free as possible. - Get a list done. Create a moving checklist for each room in your house, you can stick it to the wall and list all the things that will need to be done, packed and cleaned in each room ready to be ticked off. Get this done well in advance and put a few boxes down early so you can start to fill them as you go along. For example you can start to put kitchen appliances into the boxes that you don’t think you will be needing until you get to your new home. This way you can start to get rid of anything you uncover that you don’t want or need anymore. - Put heavy items aside. Heavy boxes, furniture and anything else that is going to be that little bit harder for you to lift, will need to be put to the side. Make sure you don’t overload boxes too much and make them hard to carry, you want to be able to lift what you can when it comes to the move. Divide heavy things up with light stuff, so you may want to wrap them in a duvet or put them with cushions to lighten the load and also this will help protect and delicate items. - Decide what you are packing for. Depending on your budget and the amount of stuff you have to move you may need to pack slightly differently. 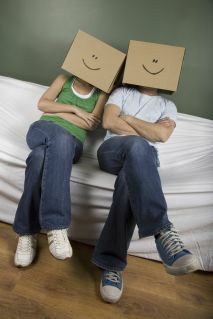 If you are doing small removals with friends then you need to ensure that everything is easy to carry. You may be hiring moving professionals in which case they will do the heavy lifting for you so you don’t need to worry too much about what you are packing, just make sure everything is securely contained and any delicate items are clearly labeled. If you are hiring a man and van then the chances are you will be expected to help with some of the loading and unloading, in which case watch you don’t overload any boxes, you don’t want to injure yourself or anyone else. - Label boxes. It’s a good idea to label things so that you make your unpacking that much easier. Decide how you might want to pack up your clothes, are you rolling or folding? You can put some more delicate items in-between your clothes to save money on bubble wrap. You can wrap bulky items such as duvets and pillows with a belt to make them easier to carry and ensure they don’t fall around. Put a bin liner over them to make sure they don’t get dirty. - Be prepared for leftovers. At the end of your move it’s not unusual to come across a lot of things you have missed, so keep a spare box or bag behind. Try to get these sorted before your professional movers arrive to make sure you don’t keep them waiting which might cause extra costs. Go back over each room when you think you are done just to check you haven’t left anything behind. Once you have gathered all your stuff together then keep things nearby the door so that moving it out to the car or van is much easier, being prepared and ready to go will be helpful in the long run.